It was my turn to pick a recipe from Bake! 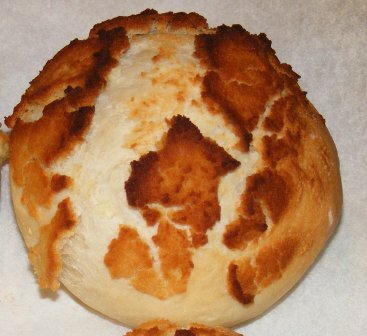 for my weekly Twitterbake with Kayte, and I chose Tiger Rolls on page 69. These rolls are simple and delicious and will become a regular feature on my dinner table. They are really good rolls in their own right, and are taken to another level by the addition of Dutch crumb topping. 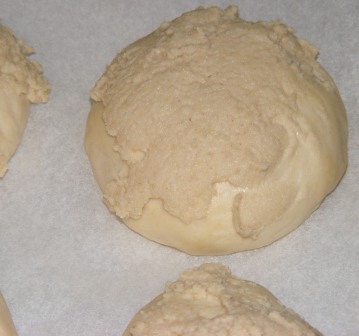 To make these rolls, I started by making the One-step Bread Dough on pages 64-65. 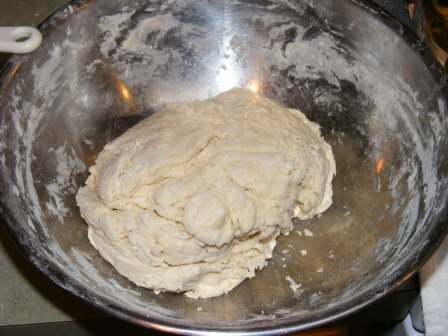 The dough is made with flour, salt, yeast, water, and oil, which I mixed in a bowl with a rubber spatula. 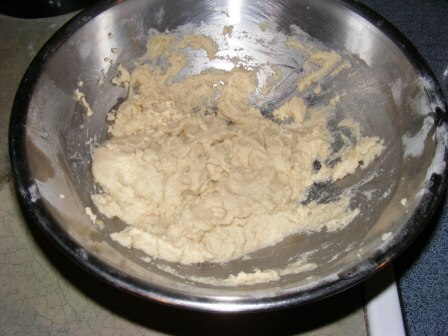 After the initial mixing, I allowed the dough to rest for 15 minutes, then mixed it again. 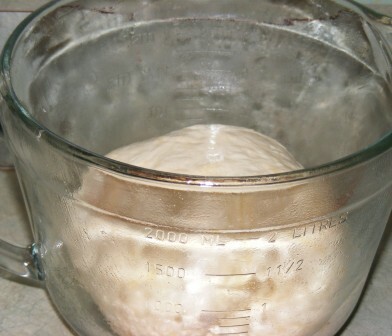 I let the dough rest again, then turned it out of the bowl, gave it a stretch and fold, and put it in an oiled bowl to rise. After a second stretch and fold, I put the dough back in the bowl and allowed it to ferment until it had doubled in volume. 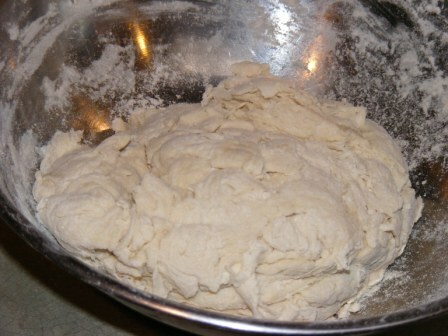 At this point the dough was ready to be made into rolls. I turned the dough out onto a floured board and patted it into a rectangle. Using a bench scraper, I cut the dough into 12 pieces. I then shaped the pieces into individual rolls. 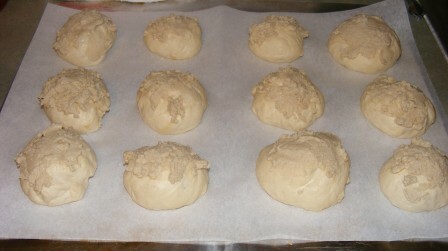 I let the rolls rest while I made the topping, consisting of yeast, water, sugar, salt, olive oil, and rice flour. This is a fairly typical Dutch crumb topping, which is spread onto the top of the dough before baking. As the rolls rise in the oven, the topping dries and cracks, creating a mottled effect. 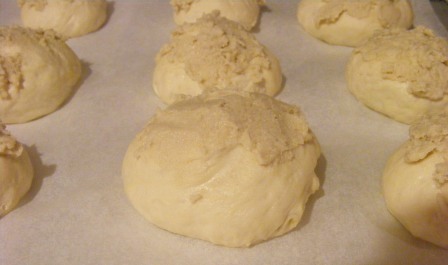 I spread the Dutch crumb on the rolls with a small offset spatula, then set the rolls aside for a final rise. 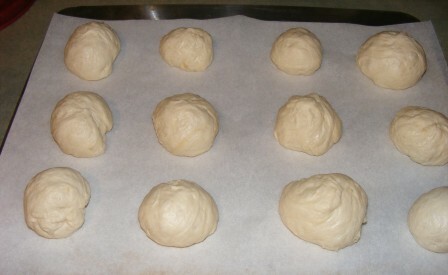 The rolls proofed for about 45 minutes, until they had nearly doubled in size. While the rolls were proofing, I preheated the oven to 375°F. 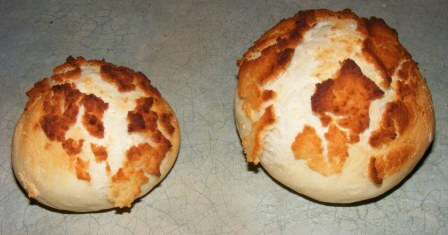 I baked the rolls for 25 minutes, until they were well-risen and the topping was lightly browned and crackled. These rolls were light and airy inside, and the crust had just the right amount of tooth to it. The Dutch crumb topping was slightly sweet, crunchy, and just a bit yeasty. Taken together, these were among the best rolls I’ve ever tasted. I had two of them right after they came out of the oven, and another one or two later in the evening. They were as good at room temperature as they were straight out of the oven. Nick calls these “Tiger Rolls” because of the appearance of the Dutch crumb topping after it bakes and cracks. Looking at them, I thought they looked more like giraffes than tigers, so I’ve renamed them “Giraffe Rolls”. The next time I make these rolls, I will scale the dough. I generally scale any dough that I’m going to divide, whether into two loaves or 24 rolls. I didn’t do that with these rolls, which you can tell by looking at a few of the rolls side by side. OK, so maybe it’s a baby giraffe standing next to its mama. These were fine for a casual weekend family supper, but if I were making them for a dinner party, I would definitely use my kitchen scale to make sure the rolls came out more uniform in size. In any case, they were really delicious and reminded me how much I love Dutch crunch. 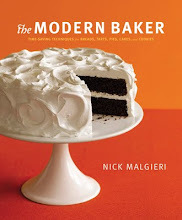 This was another successful recipe from Nick Malgieri’s newest book, Bake! If you want a great baking book with lots of techniques and great recipes, you should pick up a copy. If you do, we’d love to have you Twitterbake along with us. Kayte couldn’t wait to make her next pick, so we are making Spinach & Bacon Tarts tomorrow. So much baking, so little time…. I have an electric oven, and it worked fine. I fell in love with Dutch crunch when I make Vienna bread from BBA. For a while, I put it on almost every bread I made! When I made the Vienna bread, I skipped the Dutch crumb, and reading other people’s posts I regretted not using it. In that case, I really don’t know. But I’d try it anyway. Wow, great process photos, and for once, all my steps looked exactly like yours! 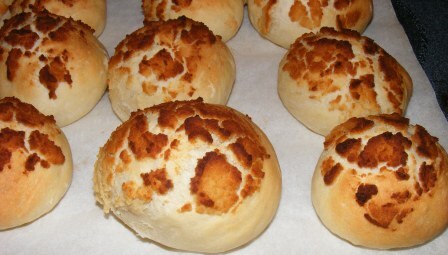 Love the new Giraffe Rolls name, you are right, they do look more like Giraffe skin than Tiger skin. Delicious either way. Like you, I did not scale the dough either as I was afraid of deflating it trying to get the balls exactly the same sizes, so mine were a little off as well for sizing, but no matter, it seemed to work fine and the next time I will try scaling to see if it deflates them too much messing around adding a little one from this to that and such. One thing is that I see you put them all on one pan and mine would not fit on one pan without crowding…maybe my pan is smaller. Going back into my post to link yours so readers can see process photos of this and your excellent looking rolls! Fun…great choice! I have a pretty good size cookie sheet that I use for things like this. I also have an even larger one (it takes up most of the rack in the oven) that I can fit double batchen on. I don’t think scaling would be problematic. Once you get an idea what size they should be, you can pretty much cut them about right. And they have another rise after shaping, so any loss of volume due to deflation should be regained in the final proof. Your rolls looked great. I felt the pressure after seeing yours while waiting for mine to come out of the oven. But in the end, you’re right, they looked almost exactly alike. Thanks, Nancy. These were really good and reminded me of the Dutch crunch topping on the Vienna bread in BBA.